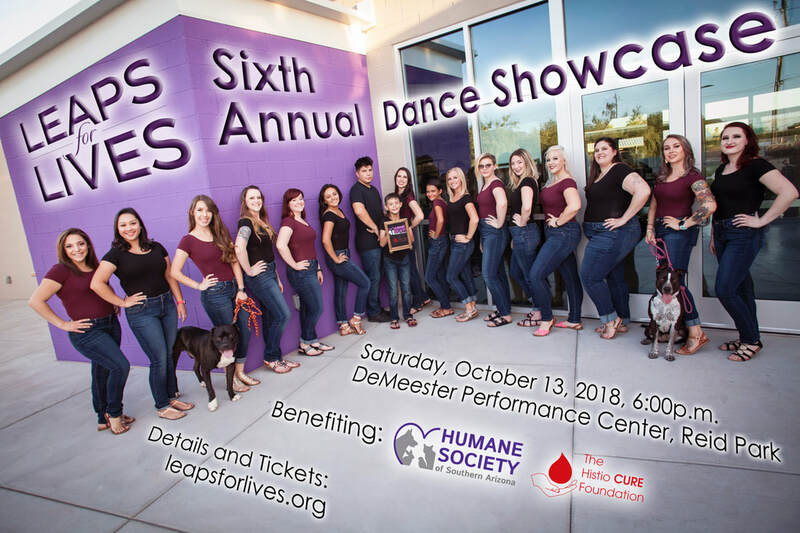 The Leaps for Lives Dance Company is pleased to announce that we were able to raise $1,217.24 for The Humane Society of Southern Arizona and $304.31 for The HistioCURE Foundation at the 2018 Leaps for Lives Dance Showcase. THANK YOU to all of our sponsors, guest artist and attendees - YOU made this years event an enormous success! We could not have done it without the love and support of the Tucson community. This years primary beneficiary is The Humane Society of Southern Arizona (HSSA.) 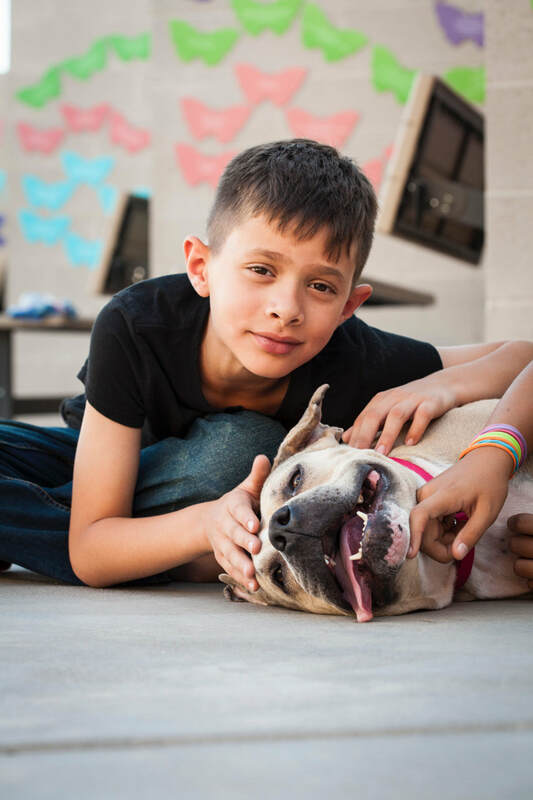 The HSSA is the oldest and largest nonprofit in southern Arizona serving pets and the people who love them. Their mission is acting with compassion and responsible stewardship through innovative programs that serve pets and the people who love them. Their vision is a community in which all pets are cared for and loved. This years secondary beneficiary is The HistioCURE Foundation. The HistioCURE Foundation has been created with one purpose - to find a CURE for all histiocytic disorders. Their mission is to raise funds to support major research programs focused on finding a CURE for these diseases. Gabby is a gentle 5-year-old girl who is a complete love bug! She will gladly follow you around the house and give out doggie kisses. Her favorite place to be is next to you which makes her the perfect binge watching partner. When she is not napping she loves massages and belly rubs. Gabby is a very photogenic girl who has been featured in many HSSA promotions including our recent Chipotle fundraiser. Gabby’s story has been shared on KVOA, The Explorer, Arizona Daily Star, 104.1 KQTH, and 93.7 KRQ. She has also made live appearances on Fox 11 Daybreak, Tucson Morning Blend, and KOLD Noon Notebook. Gabby’s atopic dermatisis is considered severe and includes redness and swelling in her feet along with possible fungal infections of her toenail beds if left untreated. Gabby will need medication, medicated baths, and a special diet that includes vitamin E and fish oil. 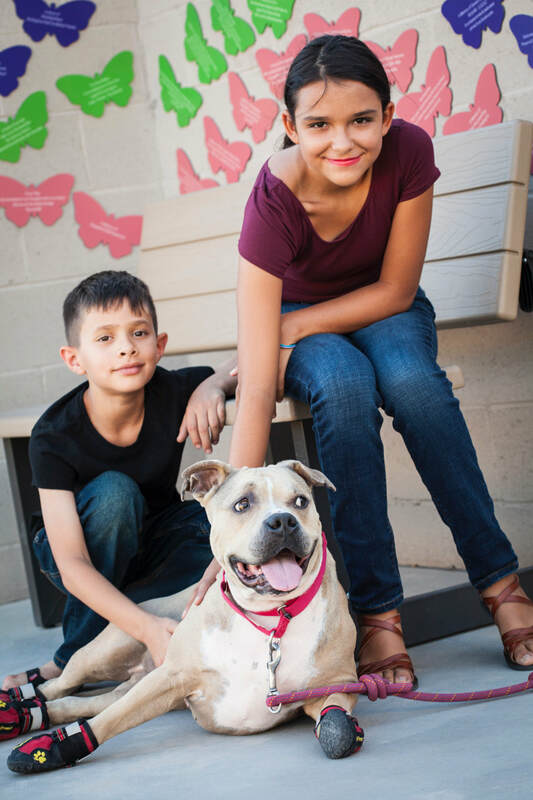 Two of our Junior Company dancers with the adorable and adoptable girl, Gabby (855429) from the Humane Society of Southern Arizona!